Help support Mike: Bookseller here! Any and all support is gratefully appreciated! 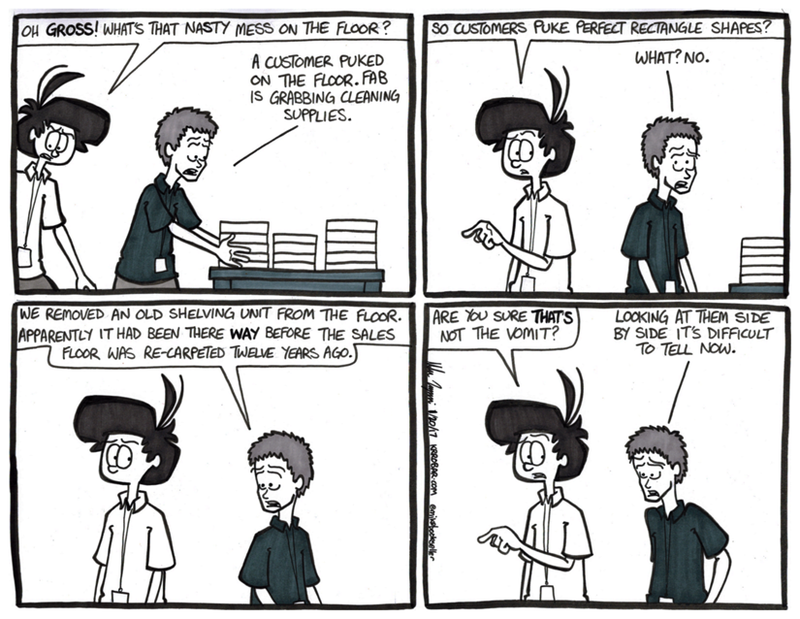 For a lot of employees who’ve worked for The Bookstore for over a decade or more may remember the old carpets. They were not the kindest to the eyes. When the new carpet replaced the old a lot of what happened was the old carpeting was cut around existing displays and new materials added after. Those displays still contained the hideousness of The Bookstore years of the past. Things change and fixtures and shelves will move from time to time unearthing things best left in the past. Shawn’s email jogged my memory of moving displays and finding old carpets like that. There was plenty of carpet uncovering when I was closing down the Westgate store and here and there a display moved at Stevens Creek to reveal more ugly carpet. Bright, garish patterns and uncomfortable colors, the decision years ago to change it all to a boring green was for the best. Thanks for the email, Shawn! !